What Comic Art Supplies Do You Need to Get Started? Besides pencil and paper, find out some other tools that you could be using in comic art. One of the best parts of pursuing comic art and drawing as a hobby is that you can start working on your creations at virtually no cost because the supplies are available for negligible prices at local stationary stores; then there is the immense potential to learn and also earn once you get good at it. Add to this the fact that drawing comic art is a hobby that you are bound to get engrossed in; leaving all your mundane tensions at bay, so it is not difficult to understand why the art form is coveted as a stress buster and an extremely enjoyable pursuit. If you are all set to give shape to your imagination, here is a look at the beginner art supplies that you will need as you start and the comic art supplies that you will need to purchase as you advance. To begin with, you will only need four things to indulge in your hobby: pencils, drawing paper, eraser and a pencil sharpener. Here is detailed information about these beginner comic art supplies. 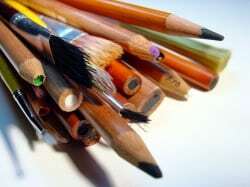 Pencil: When you are just starting, you can use just about any pencil and other supplies that you can get your hands on; as you improve, you will need to look for pencils in different grades that will help you to create the effects that you need. When you are learning to draw, a 2B pencil will be ideal for you; this can be used to produce the deep blacks and also the soft grays. If you intend to make small sketches, mechanical pencils will be more suitable for the job because they are available in a range of grades and sizes and they have a fine point, so you will not have to worry about sharpening the pencil frequently; however, these pencils do not work well for large drawings that may need shading. You would end up spending a lot of time and effort to make a large drawing with these pencils; instead, it would be more appropriate to use a wood pencil with a thick lead. Drawing paper: There are scores of options to choose from when buying drawing paper; many of these are more suitable for experienced artist as they can be used to create a plethora of textures. As a beginner, photocopy paper will be the ideal choice for you because it can withstand a lot of erasing without getting damaged; also it is quite inexpensive alternatively, you could purchase a sketch book; these are available in a variety of sizes and grades. Erasers: A small white plastic eraser should do just fine when you are starting off; ensure that you buy a good quality eraser that does not ruin the paper. Never use an ink eraser on drawing paper as there is a likelihood of the paper tearing. Sharpeners: You will also need a good sharpener to keep your pencils in good shape; any good sharpener whether mechanical or manual should do. For those who are moving on to a more detailed approach, here are some recommended tools. LeadHolder ( Clutch Pencil ): Very similar to mechanical pencils, leadholders have thicker leads (a px 2-5 mm).Stronger lead core than pencil, a favorite among draftsmen and artist.Also have a variety of leads grades and best for making full sketches . Charcoal: People who use graphite pencils tend to find charcoal abrasive; however, it can be used to create stunning effects; when using charcoal, you need to remember that charcoal sticks are prone to smudging and you need to be extra careful so as not to ruin your drawing; you can also buy charcoal pencils; these can be used to draw wood, eye lashes, dark lines, hair, fabric etc. Pastels: These can be used for painting and drawing; pastels are powdered colors that are turned into a pencil or stick with the help of a binder; they can be used to create amazing colored effects and are available in a variety of hues. Blending stubs: These are used to blend certain areas of the drawing; you could also use Q tips or tortillons for the job; as you collect more experience, you will be able to form your own characteristic style of blending and creating various textures through the use of different blending tools. Kneaded Eraser: This s a ‘must have’ for all experienced artists; the putty eraser can be kneaded into just about any shape and does not leave any residue. You can use to erase inside the drawing by kneading it into a sharp point; the moment you use it on the paper; the graphite particles adhere to its surface. Once the eraser is dirty, you can simply knead it to a cleaner portion. Also available in the market are kneaded eraser pencils; these look like regular graphite pencils; however, an eraser stick is used at its core; the pencil can be sharpened like regular wood pencils and the sharp point thus created can be very useful when working on an intricate design. Bristol paper is very ideal to draw your comics on.Bristol board pads are among the most popular options, since they absorb ink well, have a heavy paper weight and are relatively cheap. Fixative: Pencil, charcoal and pastel drawings are prone to smudging; if you would like you work to look great months or even years down the line, you will need to use a fixative. It is an acrylic spray that protects the drawing without changing the color of the paper. Horse hair brush for drafting: This is commonly available at almost every art supply store; you can use the brush to get rid of eraser residue that can create a hindrance when drawing. There are many other supplies that you will need to purchase as you progress depending on the medium that you intend to use for your master pieces. The least expensive way to buy comic art supplies is to get them online.